In India, natural calamities such as floods, droughts, cyclones and earthquakes have caused widespread damage and disruption. Disaster management emphasizes the need for incorporating multi-functional, multi-disciplinary and sectoral approach involving engineering, social and financial processes. Unfortunately, India does not have a good record on the front of disaster management. Natural disasters cannot be prevented from occurring, because they are part of the natural environment in which we live. But what we can do, as far as possible, is to take precautionary measures at different levels of society to minimize the impact of these natural disasters on the people and their properties. Here we are providing you detail of all these aspects in the following four articles of varying words length 300, 500, 600 and 800 words each on Natural Calamities in India; you choose any of them as per your need. There is an urgent need to focus our attention on natural disasters that are taking place the world over due to damage to the environment. India and other countries are paying the price for environmental imbalance leading to natural disasters, which can be defined as natural phenomena, leading to extensive loss of lives and properties. There is increasing consciousness across the world about the environment in the wake of natural calamities, but it is not making any difference on the actual ground. Only lip service is being paid to environmental protection. There is a mounting concern on environmental imbalance in India too and its impact on the individual, society and the life of the nation. But the efforts to reduce the environmental imbalance are proving to be inadequate. There are human factors too for environmental imbalances. Prominent among them are a growing population giving rise to more human needs and consumerist tendencies. Both of these have an impact on natural resources and the sustainable capacity of the country is shrinking. Cutting of trees, land mines, misuse of water and atmospheric pollution are serious threats to the environment. All these factors have led to increase in natural disasters. The growing need for water is constantly decreasing level of ground water, the toxic industrial solvents and dirty gutters flowing into the rivers are polluting our water resources. Dirty smoke and greenhouse gases emanating from factories and vehicles lead to the pollution of the atmosphere. This situation might deteriorate in future and the life of creatures on earth will become very painful. To avert calamities, sustainable development should be given top priority. Environmental considerations should be at the centre of all development projects. We also need to strengthen the mechanism to gain information about international network of satellite data for disaster information (disaster forecast). There should be permanent mechanism to deal with natural disasters in sensitive areas. A disaster can be defined as a tragic event, such as an accident, fire, terrorist attack or explosion, which inflicts damage on its victims. A natural disaster is a natural risk or hazard caused by the Earth’s natural processes with terrible economic, humanitarian and environmental consequences. It causes a large-scale loss of life and property. So many people lose their lives during a natural upheaval and for those who are left out homeless having lost their near and dear ones; life becomes a daily struggle for survival. A natural disaster manifests itself in the shape of several natural hazards such as avalanches, earthquakes, volcanic eruptions, landslide, floods, tsunamis, storms, blizzards, droughts etc). These calamities wreck unbearable destruction. Human vulnerability and lack of proper planning and disaster management practices compound the woes of people with grave implications in terms of the economic, humanitarian and environmental costs. When a natural disaster strikes, it wrecks unimaginable loss of lives on the Earth. It destroys everything in a moment. Human response to natural calamities requires proper planning and emergency management. India has not made much headway on the ground of disaster management as its lack of preparedness has shown time and again in the aftermath of calamities. In the 2013, Uttarakhand floods, when the fury of nature struck the hill state, there was no disaster management plan. Despite the fact that hilly terrains are always surrounded by the threat of natural disasters, the state government had shown no adequate preparation. According to a Comptroller and Auditor General (CAG) report tabled in March 2013, the State Disaster Management Authority, which was formed in 2007, did not meet at all between 2008 and 2012 to suggest and implement any remedial measures in the event of a natural calamity. The CAG report also pointed to widespread irregularities in the use of State Disaster Relief Fund. How to cope with natural disasters? Despite tremendous scientific and technological advancements, we do not exactly know when and where a particular disaster will strike. It is a natural process and we cannot stop it. But with some preparation, we can lessen its occurrence and also reduce the magnitude of the loss of life and property post-disaster. For instance, global warming is the root of all the problems, efforts must be made to preserve and protect the environment to prevent climate change. Efforts should be made to devise an advance warning system to minimize the impact of disaster. People should be made educated about the need for evacuation. More and more stress should be laid on constructing buildings that are strong enough to withstand an earthquake. After any disaster, the adequacy of the money to rebuild our lives can further add to the woes of people. People should take steps to obtain comprehensive insurance coverage for damages to them, their houses and belongings after the occurrence of flood, earthquake, landslide, major fire or any other natural calamity. Natural calamities are occurrences that take place as natural disturbances, resulting in widespread destruction of lives and properties. Thousands of people in India are killed every year due to natural calamities such as floods, earthquakes, heavy rains, cloud bursts, lightning, landslides, and other natural disasters. Later, thousands of people die from diseases caused by natural disasters. Despite widespread destruction caused by these occurrences, the country does not have an effective disaster management system in place. Earthquakes, landslides, droughts, floods, tsunamis and cyclones are major examples of natural calamities. In terms of earthquakes, Himalayan, sub-Himalayan regions, Kutch and the Andaman and Nicobar Islands are the seismically vulnerable regions in India. Earthquake is caused by the increase in internal pressure between the tectonic plates – huge rock pieces within the earth’s crust – which causes them to break apart. The earth starts shaking and if earthquake’s seismic intensity is high it leads to collapse of buildings, houses, bridges etc, leading to loss of lives and properties. In addition to simple and mild earthquakes, severe earthquakes have occurred in different parts of the country such as Uttarkashi (1991), Latur (1993) and Jabalpur (1997). Landslide occurs due to sliding of rocks caused by gravity, friction, earthquakes, rains and man-made acts. Draught is caused by the fall of lower volumes of rain. It is mainly of three types – of meteorology, hydrology and agriculture-related. The 16 percent area in the country is drought prone. Severe drought occurred in the country in 1941, 1951, 1979, 1982 and 1987. North-western part of the country is highly drought-prone region. Floods come due to more rain in a short time, low pressure areas and low exit-flow. India is the second highly affected country where floods are common in the rainy season. Nearly every year, terrible floods occur leading to occurrences such as loss of life, damage to property, and human health problems. National Flood Commission has determined 40 million hectares of land as the flood-prone area in the country. Ganga, Brahmaputra, Narmada, Tapi, Godavari, Krishna and Cauvery river valleys comprise most flood prone areas. Typhoons occur due to earthquake (tsunami) in the oceans. Cyclones come due to temperature and pressure variations in the ocean. In the Bay of Bengal and the Arabian Sea, 5 to 6 tropical cyclones take place every year. West Bengal, Orissa, Andhra Pradesh, Tamil Nadu parallel to the east coast in the Bay of Bengal, and Gujarat and Maharashtra parallel to the west coast in the Arabian Sea states are the areas with high potential for cyclones and tsunamis. Wildfire or forest fire occurs in rain forests or in the forests of trees with tall leafs. It often takes place in the forests of conifer and evergreen trees and those with big leaves in warm and dry areas. Wildfire is dangerous for environment, agricultural land, animals and insects. Over-exploitation of natural resources has led to environmental imbalance which also contributes to increasing instance of natural disasters. Due to the result of unscrupulous exploitation of nature, sometimes we have floods in some parts of the country while some are afflicted with drought. There is undue exploitation of water resources due to increasing urbanization and industrialization. It has led to contamination of water and decrease in ground water levels. In the wake of increasing concretisation, we do not have adequate groundwater recharge. In cities, there is massive accumulation of wastes, which is being dumped on the spot without treatment. These are only few instances of man’s greed that is playing havoc with nature’s balance. We need to embrace development, which is in harmony with Nature. Otherwise, by ignoring Nature, we will only be scripting our own destruction. Natural disaster means a sudden occurrence causing extensive havoc – physical damage, loss of life and property. This situation is unfavourable to human, physical, environmental and social functioning; it causes human suffering, harm to property and environmental degradation on a massive scale. The incident often is more frightening than the capacity of the people living in the affected area to withstand it. Water and climate-related disasters: Cyclone, whirlwind and storm, hailstones, cloud bursts, heat and cold waves, avalanches, drought, thunder and lightning. Land-related disasters: Landslides, mud flows, earthquakes, dam failure, mine fire. The worst storm in the old world had come in 1201 in Egypt and Syria in which 10 million people were killed. In early 1556, 8.50 million persons were killed immediately in the earthquake in China. In India, the worst earthquake occurred in Calcutta in 1737 in which 3 million casualties were reported. The most earthquake-prone countries include Russia, China, Syria, Egypt, Iran, Japan, Java, Italy, Morocco, Turkey, Mexico, Afghanistan, Pakistan, Greece, Indonesia and Colombia. The Himalayan region is extremely sensitive to earthquake because the inner rocks of the Earth in this area are steadily shifting to the north. There are 10 dangerous volcanoes in the world which can destroy vast areas of the Earth. According to UN International Disaster Mitigation Strategy (UNISDR), India is second only to China in the case of natural calamities. In India, disasters are determined mainly by the framework of geo-climatic conditions and their underlying weaknesses. Because of the intensity of these causes, various disasters keep recurring on a regular basis. In terms of effects and uncertainties, the frequency of climate-induced disasters, is the highest in the country. 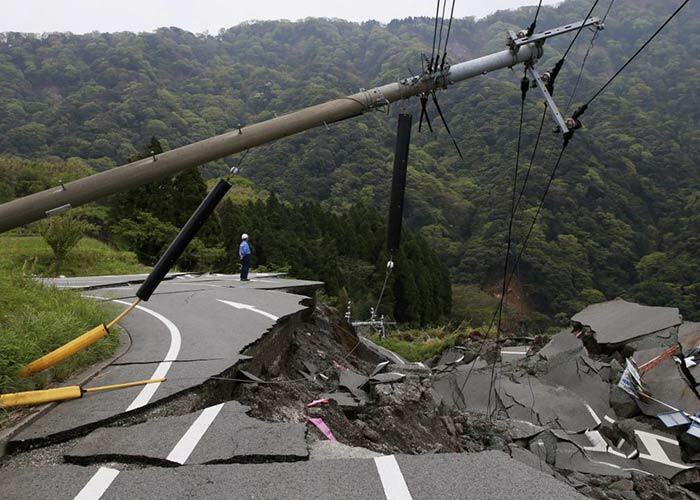 Nearly 59 percent of the territory of India is prone to earthquakes. Himalayas and its surrounding area, the Northeast, the region of Gujarat and the Andaman and Nicobar Islands are extremely seismically sensitive areas. Gujarat, Maharashtra, Andhra Pradesh, West Bengal, Karnataka and Bihar figure in top 10 states in terms of damage to human life, livestock, houses and damage to crops. In Andhra Pradesh, Rajasthan and West Bengal cattle suffer the most in calamities. The highest damage to human life occurs in Uttar Pradesh, Bihar, Karnataka and West Bengal. Damage to houses and crops are also highest in these four states. The super cyclone in Odessa in 1999 and earthquake in Gujarat in 2001 were most destructive in terms of the severity of the damage in the last decade of the century. On December 26, 2004 earthquake struck in the coastal areas of India which created tsunami waves that caused extensive loss of life and property of high magnitude in Andhra Pradesh, Kerala, Tamil Nadu, Puducherry and Andaman and Nicobar Islands. This was India’s experience of the tsunami disaster for the first time. In 2005, flood shook the whole of Mumbai, India’s commercial capital. Floods caused by inundation of river Kosi in Bihar in 2008, hundreds of villages were submerged. Flood caused by cloudburst in Leh in Jammu and Kashmir in August 2010 killed nearly 113 people. Cloudbursts in Uttarakhand in 2013 caused tragedy of unprecedented magnitude, resulting in the death of thousands of people. Projects are going on indiscriminately in the name of development and urbanization. All this is causing unimaginable damage to the environment. The hills are being damaged in the name of electricity, water, tourism and development. Deforestation is going on in plateau areas. Nature is being overexploited for extraction of minerals. Massive tree-cutting is going on in the plains. Disaster Management Bill was approved by the Parliament on 28 November 2005 to combat calamities in the country, to reduce them and to rehabilitate the victims under a deprived institutional mechanism. It was enacted into an Act on December 23, 2005. Under there is a provision to establish the National Management Authority headed by the Prime Minister, the State Disaster Management Authority headed by Chief Ministers, and District Disaster Management Authority under the Chairmanship of District Judges. It also has a provision to prepare National Disaster Management Plan by the concerned ministries and departments. It also seeks to form a National Disaster Response Force for emergency action the National Disaster Management Institute for training and capacity building. The Act also has the provision to constitute a National Disaster Response Fund and the National Disaster Mitigation Fund and similar funds at state and district levels. Despite all these measures by the government, awareness is the first condition of effective disaster management and relief agencies should have immediate access to the affected region. If people do not have the awareness of the disaster, the terrible destruction poses a problem in relief. If possible, giving basic information to rescue people in disaster areas can be used to reduce the damage caused by the disaster. The disaster management planning, proper communication, honest and effective leadership, coordination, etc are very important.